Upon arrival at Cairo International airport our representative will welcome & assist you. After which you will be transferred a hotel via an air-conditioned vehicle. Overnight accommodation is arranged for your convenience in Cairo. After a delicious hotel breakfast start your tour of this Egyptian city by going around the Egyptian Museum. The site of more than 120,000 artifacts, there you can visit the room of the child king Tutankhamen. 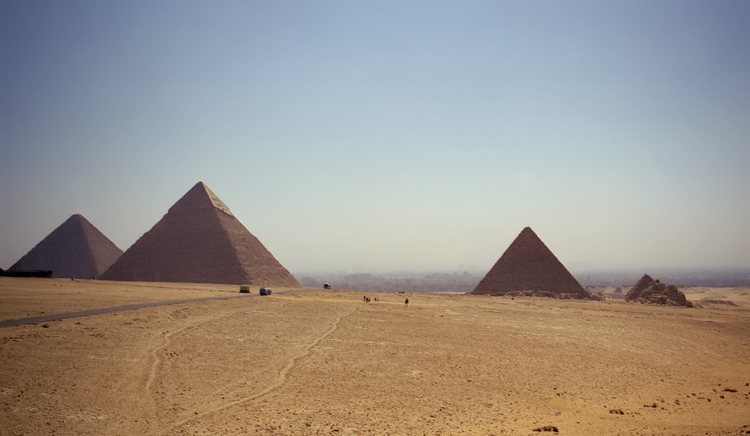 When done touring the museum proceed to the Pyramids of Giza. While there get a chance to visit the Great Sphinx and valley temple fronting it. There you will have an opportunity to go on an exotic camel ride. Have lunch in a local restaurant near the pyramids area. As evening approaches transfer to Giza Railway Station to take a train going to the southern city of Aswan. Dinner and accommodation is arranged onboard the train. Experience the best of Egypt in a whole new way. Upon arrival at Aswan train station a representative from 123EgyptTours.com will meet you for assistance. You will then be transferred to the Nile Cruise Ship for embarkation just before lunch. You will enjoy an amazing lunch onboard then move with your tour guide to visit the High Dam, the Granite Quarries and the Temple of Philae. Dinner will be aboard the luxury liner as well as overnight accommodation. After breakfast aboard the cruise sail to Kom Ombo to visit the famous “double” temple more known as the temples of Sobek and Haeroris built for Ramses II for himself and his favorite wife Nefertari. Return on board to have lunch and sail towards Edfu, home of the Horus temple one of the best preserved temples along the Nile River. Dinner and overnight accommodation will be onboard the cruise. Enjoy an amazing view of the River Nile during sunrise, have breakfast onboard the Nile cruise ship while sailing to Luxor. Luxor is also known as the biggest open air museum in the world with its vast temples and landmarks there is not a minute to waste in this city. Visit the East Bank where you will see the vast interconnected temples of Karnak and Luxor. Your adventure Egypt climax will continue with your retreating to your 5 star cruise for afternoon tea, dinner and overnight accommodation. Disembark the Nile River Cruise after breakfast, and pay a visit to the West Bank of the River Nile in Luxor. The west bank of Luxor boasts of the famous landmarks such as Valley of the Kings, the temple of Queen Hatshepsut at El Deir EL Bahari and the Colossi Memnon. After enjoying the day of touring, transfer to Luxor Airport for flight to Sharm. Upon arrival at Sharm Airport, transfer to your hotel in Sharm El Sheikh where you can have dinner and overnight accommodation. This will be a free day to enjoy in Sharm El Sheikh or you may take an optional tour to Ras Mohammed National Park which is both a terrestrial and an aquatic nature reserve. The 480 square kilometer protected area that lies where the Gulf of Suez meets the Gulf of Aqaba in Sinai's southern extremity. The arid desert terrain of sand dunes, gravel plains, fossilized corals and Granite Mountains is home to a number of rare mammal species: such as the Dorcas gazelle, Nubian ibex and red fox. Easier to spot are the resident birds like terns, herons, gulls and ospreys. Thousands of white storks pass through Ras Mohammed each year, heading south during September/October and back north during April/May. About 85 flora species live in the park, including mangroves. Free day in Sharm El Sheikh or take an optional tour to one of the natural wonders of the Sinai, the awe-inspiring Colored Canyon. Take a walk in between dramatic sandstone canyon walls that is streaked with melting yellows, purples, reds, magenta and gold. In certain places the canyon walls reach up to 40 meters. You will feel as if you are enclosed in a spectacular coloring book. Free day in Sharm El Sheikh or enjoy an optional tour to The Monastery of St. Catherine that lies at the foot of the Gebel Musa, or Mount Moses, in the heart of the South Sinai. Fronted by gardens and cypress trees, the monastery is owned and run by the Greek Orthodox Church. Its rich library houses the world's second largest collection of illuminated manuscripts after the Vatican. You can see the Burning Bush and a large number of antique works of art: valuable icons, beautifully carved doors, exquisite wall paintings and other fine religious ornaments. Enjoy a breakfast at your hotel in Sharm El Sheikh and then you will be transferred to Sharm El Sheikh Airport for a flight to Cairo. Check in to your designated hotel for an overnight stay in Cairo. In the morning enjoy a tour around Cairo where you will see the Modern buildings as well as the famous landmarks surrounding it. First stop is the Salah El Din Citadel which was constructed by Salah El Din on the Moqattam hills in 1183 AD to defend Cairo from the armies of Crusaders. After that visit Mohamed Ali Alabaster Mosque which was designed by the architect Yousif Boushnaq, a Turkish man who came especially from Istanbul to build this great mosque for Mohamed Ali, an Egyptian ruler of some 45 years (1805-1849). Then proceed to visit Khan El Khalili Bazaar, one of the most famous and oldest bazaars in the Middle East enjoy some free time for personal shopping. Visit Old Cairo where you will enjoy, the Hanging Church, Ben Ezra Synagogue, Church of St. Barbara, and the Church of Abu Serga. Return to your hotel in Cairo for overnight accommodation and dinner. The Egypt Climax Tour will culminate with the usual sumptuous breakfast you’re your Cairo hotel will be serving, check out and transfer to Cairo International Airport for your flight back home. 123EgyptTours.com will provide a personalized welcome and assistance service at Cairo International Airport upon arrival and departure. 3 nights accommodation in Cairo including daily breakfast. 3 nights accommodation aboard a 5 star superior cruise on full board meals. 1 night accommodation on sleeper train on half board basis. 4 nights accommodation in Sharm El Sheikh including daily breakfast. Entrance fees to all sites and all private sightseeing tours a mention in the itinerary and lunch on all day tours. Free personal care assistant during sightseeing tours at the historical places. All transfers via an accessible air-conditioned vehicle. Domestic flights Luxor-Sharm and Sharm Cairo via Egyptair. Professional Egyptologist tour guide during your trip. Use of mobile phone for free during your stay in Egypt (Charged with 30 minutes local & 3 minutes International) to keep in touch with your family and friends back home and the tour provider. International Airfare to and from Egypt. Egypt entry visa, for non restricted nationalities however you can buy it upon arrival before passport control. Visa Cost $ 15 or 11 Euro per person adult or child. Any additional or optional tours mentioned in the itinerary. Extra expenses in the hotels mentioned (like additional meals, drinks, laundry, among others). Tipping for the staff (not obligatory). Notes Rates are quoted in US Dollars and are based on double occupancy. Rates are valid until 30/04/2012 not including holidays like Christmas, New Year’s Eve and Easter. Moreover, rates could be changed without prior notice, shall the government increase taxes. To enter Egypt, you must have a valid passport (Should be at least 6 months valid beyond the scheduled return date). Single supplement is applied for those coming with others and prefer single occupancy. Accommodations at these hotels will be subject to availability. Group discount rates applicable for Egypt Climax Tour.